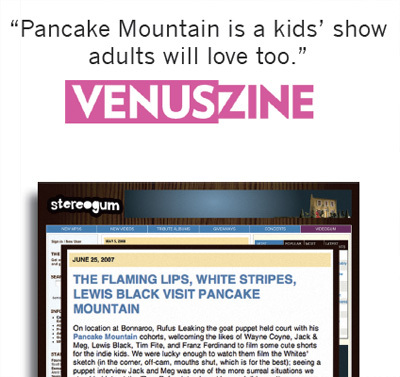 Pancake Mountain aims to bring back what got us passionate about music. We want to be able to tear down the barriers that make music pretentious and boring. We enjoy seeing the artist interact with their audience. 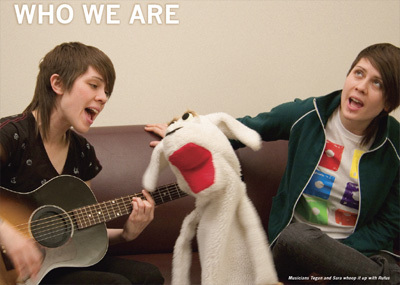 We like to have fun, we love new music, and we need an excuse to act really silly and call it our job. How do you get adults to sit down and watch television with their young kids? Simple. 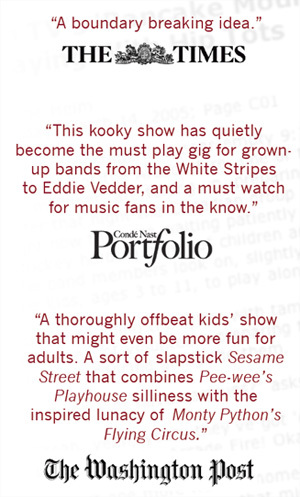 Stuff it full of the best musicians, artists and actors around, dip it in a little mayhem and cleverly disguise the whole thing as children’s programming. 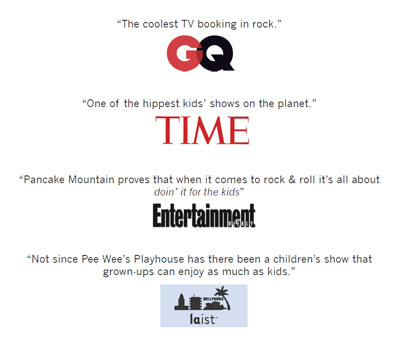 Pancake Mountain is a fun, imaginative melting pot of everything we loved about TV when we were kids—music, imagination and silliness—with an underlying lesson in good values and education. In short, we were tricked into learning by these shows...and darn it, we’re not letting future generations get off scot free. 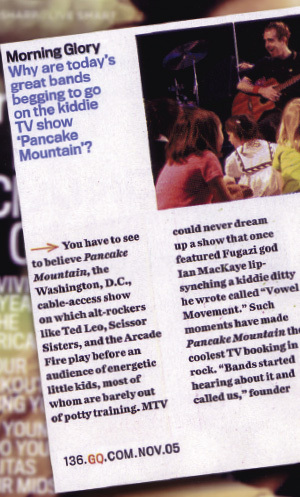 Pancake Mountain is a children’s television show originally based in Washington, D.C., created by filmmaker, Scott Stuckey. The show is hosted by smart-aleck goat puppet and self-proclaimed entertainment expert, Rufus Leaking, and features the errantly-named superhero Captain Perfect and his more sensible foil, Sam, who serve as interviewers and dance party impresarios. It’s a conglomeration of music, animation, live action segments, learning, and what has become the hallmark of our show, dance parties featuring the hottest acts in music. 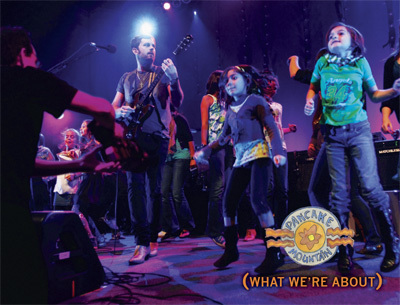 Why are so many top musicians clamoring to play for a room full of wild tots? Well, some do it because they have school-age children (or in some cases, grandchildren) of their own, and feel it’s a pathway to a better connection with their kids. But it’s primarily because, as it turns out, kids are a perfect focus group. They listen to music with no subtext, bias or preconceived notions. To them, good music is good music. If it’s good, they’ll dance. If not, they won’t. Pretty easy way to see if your music is resonating. Ultimately, the way we see it, imagination is one of the best learning tools available and we encourage kids to push theirs as far as possible. Scott Stuckey began shooting film after receiving a super 8 camera as a gift in grade school. He grew up in Washington, DC, where he was heavily influenced by the emerging punk rock scene and its DIY ethics. Armed with that influence, he moved to Athens, GA, where he opened a recording studio, engineering albums for such acts as Vic Chesnutt and REM. But his true passion was always film, and he eventually moved back to DC to begin directing music videos and documentaries for artists such as Thievery Corporation, Bob Mould, Minor Threat and others. 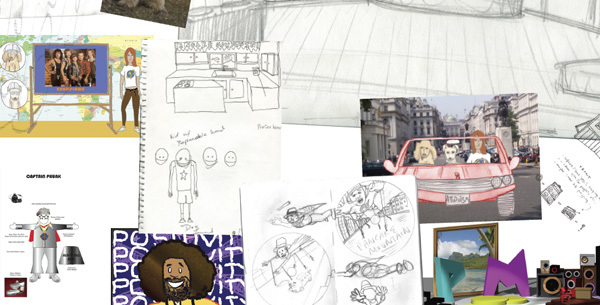 He started Pancake Mountain as an experimental meta-show influenced by children’s television shows of the 70’s such as Zoom and Wonder-rama. He hopes to one day be Mayor of Washington, DC. 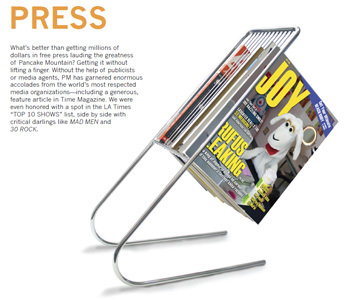 JR is an award-winning creative idea machine with over 20 years experience in marketing, branding, and advertising. His love of TV, movies, and music— and the creative process therein—led him to join The Discovery Channel as a supervising producer in 2002. 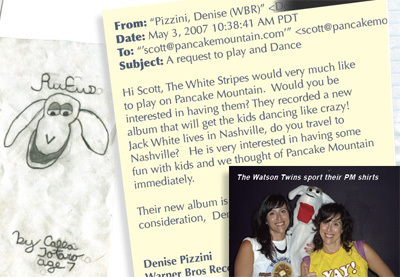 He met Scott later that year and has been involved with Pancake Mountain since its inception in early 2003. In 2008, JR moved with his family to Los Angeles to pursue full-time directing and writing outside the promo landscape. In addition to writing, editing, creative direction and graphic production for Pancake Mountain, JR performs and voices the show’s host, Rufus Leaking. Tracy and Guillaume produce, manage and maintain all of PM’s digital assets, including pancakemountain.com, and social media needs. Tracy also serves as the principle still photographer for PM events and is the primary contact for press requests, while Guillaume works tirelessly designing and producing our commercial DVDs as well as custom footage requests from media outlets and artists. Both can walk on their hands and play the accordion. Dan (AKA “KID DYNOMITE”) helps craft the look and feel of Pancake Mountain, from character and set design, to costumes and miniatures. Atop his responsibilities, he also manages and auditions the constant stream of band demos we receive, handles fan requests, writes the PM blog, and makes a mean cinnamon cappuccino. The resident set designer at Pancake Mountain, if something needs building, Jonah is the man to build it. Once, while on a lunch break, he carved a perfectly scaled replica of Michelangelo's David from a single block of gouda. He is currently trying to start a new genre of music he calls Skothic, a mix of Ska and Gothic. He lives with 4 dogs and 25 cats in the Glover Park Neighborhood of D.C. When he's not building the greatest sets in the history of public access he's running his design company, Atelier Takagi. Amy has worked in all facets of production at Pancake Mountain. She has been involved in every shoot we've had and even a few we didn't. She occasionally gets us thrown out of large festivals, but usually only after scoring large amounts of food and drink. She secured the largest budget we ever had for a Pancake Mountain shoot when she bought a winning lotto scratch off ticket with a worth of $35. However, Rufus promptly spent it all on Yoo-Hoo. We have had the extreme good fortune of working with some of the biggest, most exciting and most talented artists on the planet. And the list keeps growing every day, with a constant stream of requests from managers, A&R executives and agents to get their clients on the show. 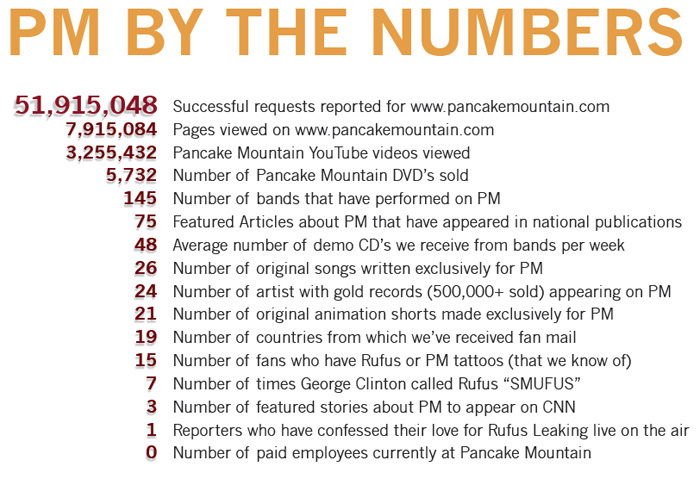 In fact, of the more than 150 artists who have appeared on Pancake Mountain we have never requested a single one to perform on the show. Rather, they have reached out to us asking to be part of the magic. (Okay, except one. But we really, really wanted him to come on the show!) From dance parties, to interviews, to joining the cast for full episodes, we’ve had a blast playing with the best around. 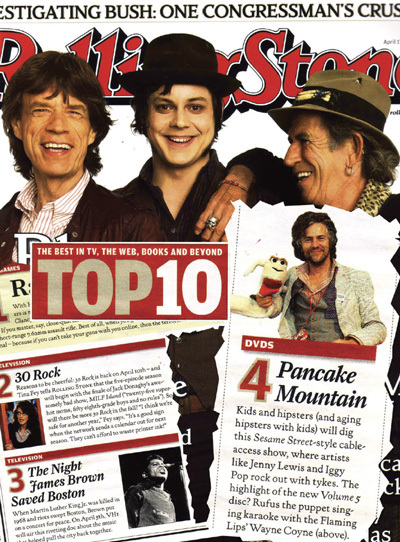 What’s better than getting millions of dollars in free press lauding the greatness of Pancake Mountain? Getting it without lifting a finger. 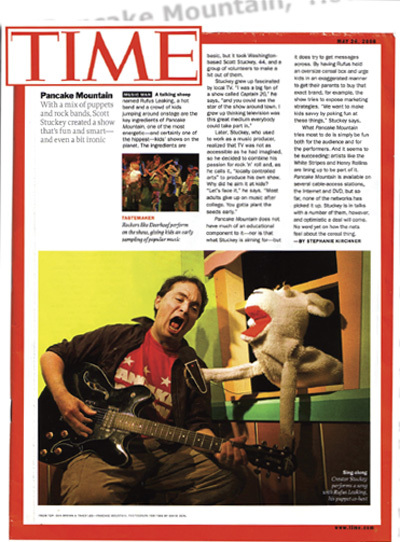 Without the help of publicists or media agents, PM has garnered enormous accolades from the world’s most respected media organizations—including a generous, feature article in Time Magazine. We were even honored with a spot in the LA Times “TOP 10 SHOWS” list, side by side with critical darlings like MAD MEN and 30 ROCK. Name another show out there—not even on a network yet—where fans contribute everything from custom music and art, to fully-produced, animated music videos…all unsolicited, and all without asking anything in return. 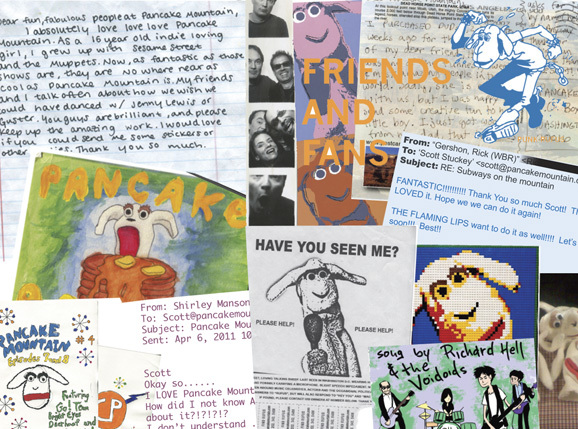 Pancake Mountain’s fans are simply some of the greatest (and we feel, hippest) around. 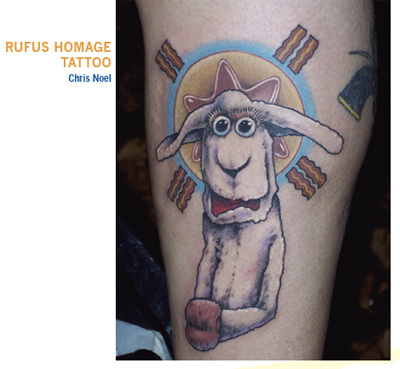 You’d have to admit, it takes real love and commitment to etch a goat puppet television host’s likeness into your skin. Permanently. Plainly put, we are never satisfied. While we’ve been blessed with amazing volunteer help from the industry’s top film and TV professionals, and while we’ve generated some memorable segments and episodes, we simply can’t sit still. Besides, how can we extol the wonder of creative imagination if we don’t use it ourselves? 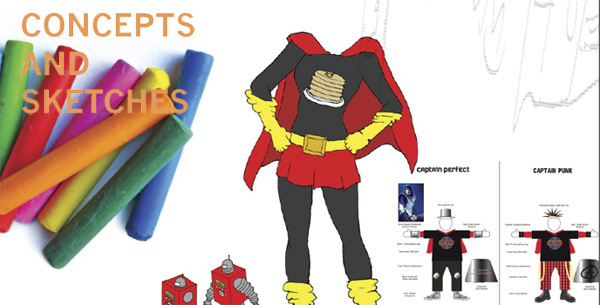 So we spend most of our free time concocting everything from new characters and costumes, to new sets and stages. Once, we even designed a ladder to the moon, but that’s a story for another time. 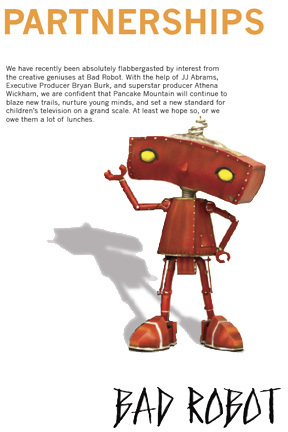 We have recently been absolutely flabbergasted by interest from the creative geniuses at Bad Robot. 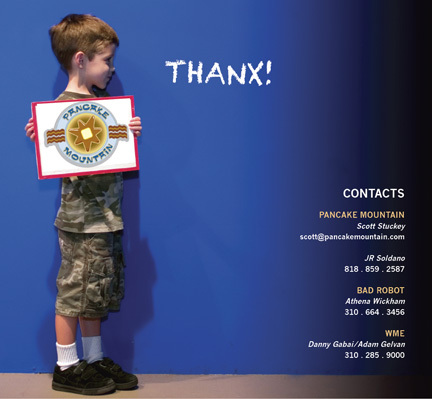 With the help of JJ Abrams, Executive Producer Bryan Burk, and superstar producer Athena Wickham, we are confident that Pancake Mountain will continue to blaze new trails, nurture young minds, and set a new standard for children’s television on a grand scale. At least we hope so, or we owe them a lot of lunches.